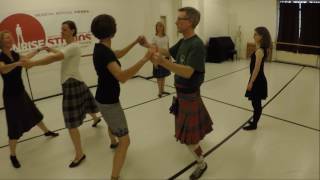 There are lots of great videos of Scottish country dances available, and I use them quite frequently if I want some details about a dance. But those video always show the dance from the outside and do not catch a dancer's point of view. And dancing is so much nicer when you are part of the set rather than watching from the sideline. I wanted to make a video, which is shot from the inside and provides some immersion feeling. We ran through the dance more than a dozen times and I collated one version from all the takes. I did not succeed of really catching a single dancer's perspective, as the clip from the body cameras were too hectic; but I like the result well enough to share. Reel4 across, 1W+2M pass Lsh to start, at the end 1M+2W curve clw to bring 1M, 1W, 2M, 2W onto midline, all facing P.